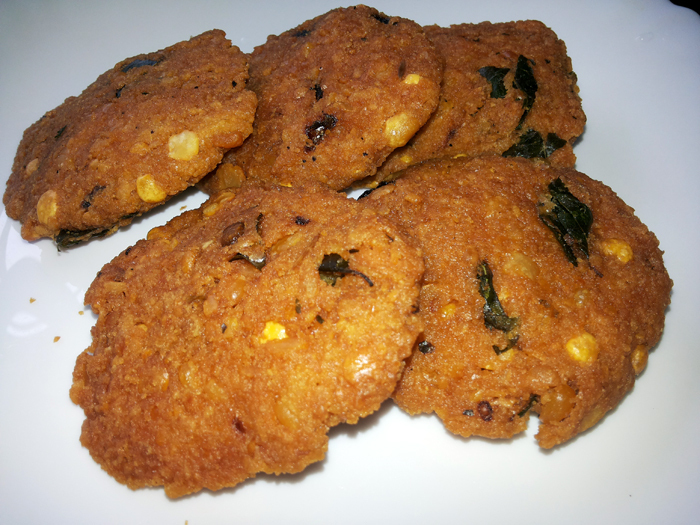 Parripu vada / Dal Vada / Lentil or Dal fritters is a nadan / traditional evening snack food in Kerala. It is prepared from Toor dal. Parippu vada along with black tea is the combination and its the official food of a Kerala communist 😉 . For every Keralite, parippu vada is a nostalgia. You will love to munch these parippu vadas in a rainy day sitting idle in the balcony. Hope you all will try this and send us your photos and comments. Wash the dal thoroughly and soak it for 4-5 hours. Drain the water completely from the dal with a colander. If any water is remaining the vada will break apart. You can use an absorbent paper for this. In a mixer, grind the dal into a paste. Do not make it into a fine paste. Chop and crush the Ginger, Red chillies, Shallots, salt and Curry leaves finely and add it to the mix. Roll out small portions of the mixture into lime sized ball and flatten it between the palms to give it shape. In a deep bottom frying pan pour the oil and heat it. Add the vadas to the oils when it become hot in medium flame. Deep fry the parippu vadas until they become golden brown. Serve it hot with a cup of Sulaimani (Black tea). In step 5, you can add Asafoetida powder, salt and powdered red pepper for making more tasty parippu vadas. Don't forget to try our other vada recipes also. How to make tasty South Indian Uzhunnu Vada / Medu vada? How to make crispy Kerala Pappada Vada snack? This entry was added on May 2nd, 2013 by Renoos in Bakery and tagged with parippu vada kerala recipe, how to make parippu vada., parippu vada recipe, kerala snacks, parippu vada kerala style recipe, vada, parippu vada, nadan parippu vada, cooking parippu vada. Last revised on April 4th, 2018. Yes, many of the recipes are very good. Only suggestion is to clean up the English. There are many mistakes. @Padathra : thanks for the appreciation. We will try to improve. If you find any errors, please use the contact us form on the bottom of any page and bring it into our attention. Love it, love indian savouries, love indian rojak! @Indzz: Happy to know it came out well for you and thanks for the comments.